The winners of the 2018 Youth Literary Derby. October 6th was ‘graduation day’ for a quartet of young Ontario students as they stepped up to the podium at Woodbine Mohawk Park to receive accolades and prizes for their literary accomplishments in the $2,000 Youth Literary Derby, sponsored by St. Catharines, Ont. horseman and construction magnate Tom Rankin. The Youth Literary Derby, a province-wide juried, horse-themed contest designed to encourage literacy skills, challenged students’ abilities to capture in prose, or verse, their impressions and perceptions of their up-close encounters with some of the 1400 young Standardbred foals born in Ontario in 2018. 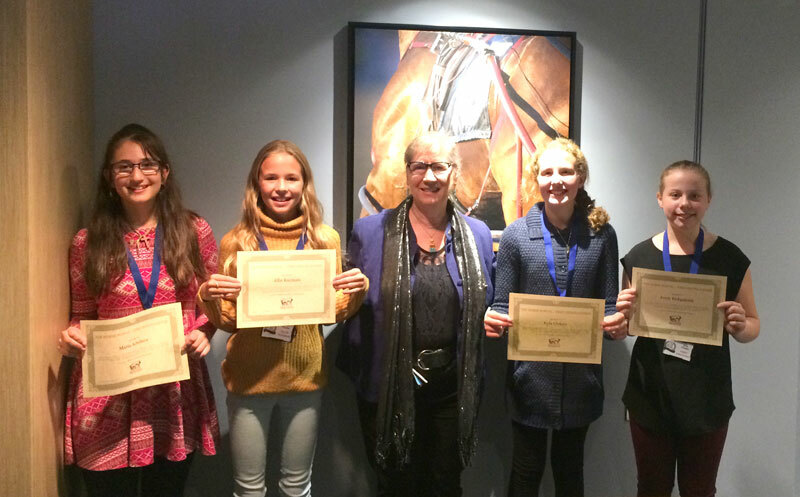 October 6 proved to be a day to remember for the enthusiastic and talented young 12-year-old wordsmiths that were introduced to big time horse racing, and the people who make it all happen at Woodbine Racetrack and Woodbine Mohawk Park. Following a tour of the Canadian Horse Racing Hall of Fame at Woodbine where they learned of the 250 -year history of the sport and racing’s greats that are enthroned there, they posed for photos with some of Canada’s outstanding female race riders. One of the highlights of the afternoon included time with Hall of Famer, Sandy Hawley, who gave each of the four winners – each of which are female – personal instructions on how to correctly ride a horse. This was done on an equicisor (synthetic horse) in the Jockey’s room. The quartet also spent meaningful time with the announcer, with the Stewards, and viewing the horses up close and personal in the Woodbine Paddock. The evening festivities got under way in a private suite overlooking the track and paddock at Woodbine Mohawk Park , and the four students were introduced to key representatives of the University of Guelph, Standardbred Canada, Ontario Equestrian Federation and the Canadian Horse Racing Hall of Fame. The Derby award winners received a hefty bonus with free donated tuition for Horse Behaviour and Safety courses from the University of Guelph. All the winners will be joining a group of horse crazy youth and teens in the next offering of this unique online course Jan 21 – Feb 8. “Equine Guelph is very pleased to have had the opportunity to partner with the Youth Literary Derby, says Gayle Ecker, director at Equine Guelph. “We hope the Derby winners will enjoy furthering their interest in horses and learning the language of the horse during this highly interactive course,” Ecker continued. The course is now open to all their friends as well at theHorsePortal.ca. Maria Achilleos, a 12-year-old student at St. John Catholic French Immersion School in London Ontario carried off first prize in the Poetry Category; 12-year-old Kyla Civiero, a grade seven student at Our Lady of Mount Pleasant School in Carlisle, Ontario earned second prize, and Marilyn Schmidt, a 12-year-old student at the Amish Parochial School in Elmwood, Ontario took third prize. First Prize in the Essay Category went to Andrew Kuepfer, a 12-year-old student who attends the Amish Parochial School in Elmwood, Ontario. Avery Kirkpatrick an11-year-old student at St. Joseph Catholic Elementary School in Bowmanville took home Second prize, and Allie Kucman, a student at the Peace Bridge Public School in Fort Erie walked away with third prize. Both Andrew Kuepfer and Marilyn Schmidt, both award winners from the Amish community, did not attend the festivities. The evening followed with the fourth race named in their honour, interviews on in-house television and visits to the announcers booth and judges stand, and cheering for their designated choices down close to the finish line. Unfortunately the students could not visit the horses and drivers in the Mohawk paddock. Youth under 16 years of age are not permitted in the Mohawk Paddock. “My favourite part of the day was watching the Standardbred racing at Mohawk and taking a picture with the winner”, said Kyla Civiero, who was runner-up in the Poetry Category. “My favourite part of the day was meeting the horses, especially one named Will Take Charge. – he was so calm and let me pet him and feed him mints out of my hand.” Maria took home the gold. She was the winner of the Poetry Category .